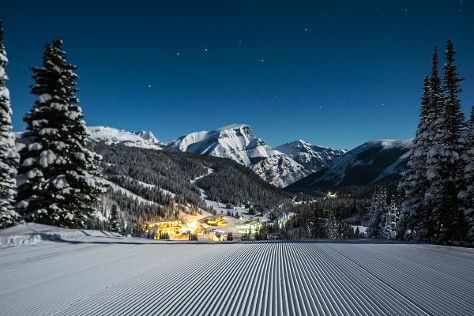 Take a break from the city and head to Marmot Basin Ski Area and Whistlers Peak. Shop till you drop at Mountain Galleries and Our Native Land. Next up on the itinerary: take in the exciting artwork at Jasper Art Gallery, get a new perspective on nature at Jasper-Yellowhead Museum & Archives, take in breathtaking views at Maligne Canyon, and hike along Skyline Trail. Start your trip to Jasper National Park by creating a personalized itinerary on Inspirock. Dubai, United Arab Emirates to Jasper National Park is an approximately 26-hour combination of flight and shuttle. You can also do a combination of shuttle and flight; or do a combination of bus, flight, and shuttle. Due to the time zone difference, you'll gain 11 hours traveling from Dubai to Jasper National Park. Traveling from Dubai in March, expect Jasper National Park to be cooler, temps between 5°C and -9°C. Finish your sightseeing early on the 19th (Tue) so you can take a shuttle to Banff National Park. Take a break from the city and head to Sunshine Village and Temple Mountain. On the 21st (Thu), spend an exhilarating day on the slopes at The Lake Louise Ski Resort. To find other places to visit, reviews, more things to do, and tourist information, refer to the Banff National Park journey planning tool . Traveling by shuttle from Jasper National Park to Banff National Park takes 3 hours. Alternatively, you can drive. When traveling from Jasper National Park in March, plan for little chillier days and about the same nights in Banff National Park: temperatures range from 1°C by day to -9°C at night. Wrap up your sightseeing on the 22nd (Fri) early enough to travel to Vancouver. On the 23rd (Sat), explore the world behind art at Museum of Anthropology and then wander the streets of Granville Island. Here are some ideas for day two: tour the pleasant surroundings at Stanley Park and then enjoy the sand and surf at Kitsilano Beach. Plan my Vancouver trip by asking Inpirock to come up with tips and suggestions. Getting from Banff National Park to Vancouver by combination of shuttle and flight takes about 8 hours. Other options: drive; or do a combination of shuttle, flight, bus, and subway. You'll gain 1 hour traveling from Banff National Park to Vancouver due to the time zone difference. Expect somewhat warmer weather when traveling from Banff National Park in March: highs in Vancouver hover around 12°C, while lows dip to 5°C. Finish your sightseeing early on the 24th (Sun) to allow enough time to travel to Montreal. Kick off your visit on the 25th (Mon): don't miss a visit to Notre-Dame Basilica, get a new perspective on nature at Biodome de Montreal, and then take in the architecture and atmosphere at Saint Joseph's Oratory of Mount Royal. On the next day, admire the masterpieces at The Montreal Museum of Fine Arts (Musee des Beaux-Arts) and then take an in-depth tour of Pointe-a-Calliere Museum. To find reviews, ratings, more things to do, and more tourist information, you can read our Montreal holiday tool . Traveling by flight from Vancouver to Montreal takes 7 hours. Alternatively, you can do a combination of flight and train; or drive. The time zone changes from Pacific Standard Time to Eastern Standard Time, which is usually a 3 hour difference. When traveling from Vancouver in March, plan for little chillier days in Montreal, with highs around 0°C, while nights are colder with lows around -7°C. Finish up your sightseeing early on the 26th (Tue) so you can travel to Toronto. Kick off your visit on the 27th (Wed): examine the collection at Royal Ontario Museum, examine the collection at Casa Loma, and then take in the spiritual surroundings of St Michael's Cathedral Basilica. On your second day here, admire the striking features of CN Tower, get curious at Ontario Science Centre, and then examine the collection at Hockey Hall of Fame. To find maps, where to stay, other places to visit, and more tourist information, read our Toronto itinerary site . Traveling by flight from Montreal to Toronto takes 3 hours. Alternatively, you can take a train; or drive. In March, daily temperatures in Toronto can reach 3°C, while at night they dip to -3°C. Finish your sightseeing early on the 28th (Thu) to allow enough time to travel back home.